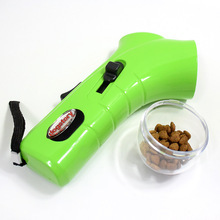 Amazing Dog Treat Launcher 1000, will have you having fun and your dog leaping and running all over the place. Fun and engaging for both you and your furry friend. Comes with a wrist strap, so it can be attached to a leash or around your wrist. This toy is great interactive fun for you and your dog. Easy to load and fun to play with – Order today – Click Add to Cart Now! !